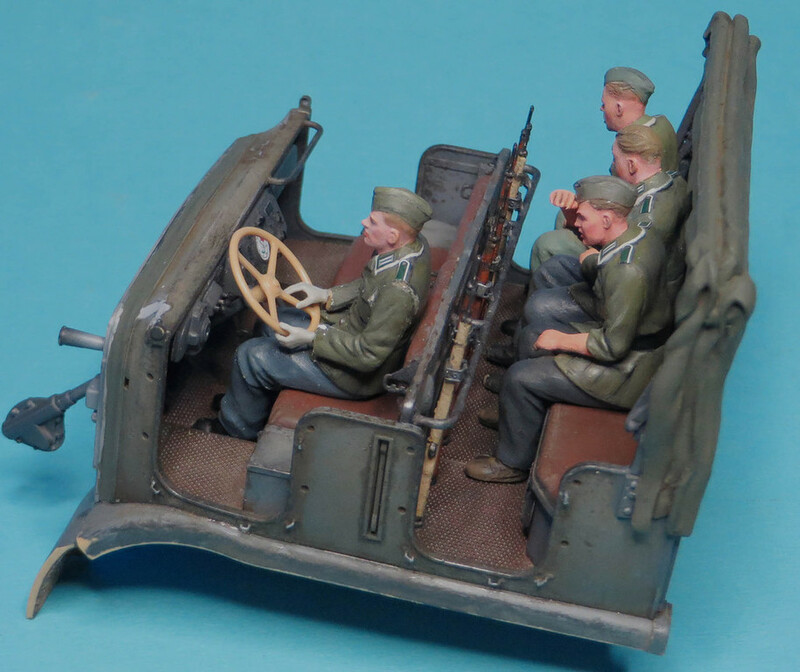 Currently still working on the figures with test fitting and detailing the crew and the cab. Have got the drivers hands finally glued into the position holding the steering wheel. The sample image with the crew looks a bit scruffy because there small particles on the figures. The crew will be tidied up before being glued into position.The images are just showing where each of the figures will be seated. 2 remaining figures to have hands glued on and then it's happy days. I have been following this epic build for a while and have to say I am impressed with this giant kit. You are really doing it justice for sure. 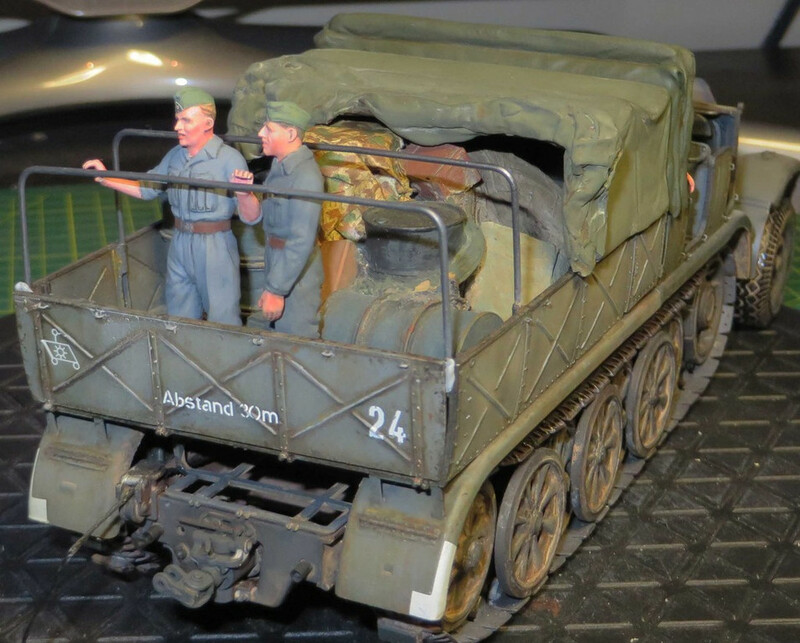 The stowage on the back is awesome and the halftrack overall looks super nice. I would offer advice on the figs sitting in the back seat though. Do you want them all to be NCOs? NCOs are the only ones to have the collars trimmed in color,along with the shoulder straps it's how you tell them apart. 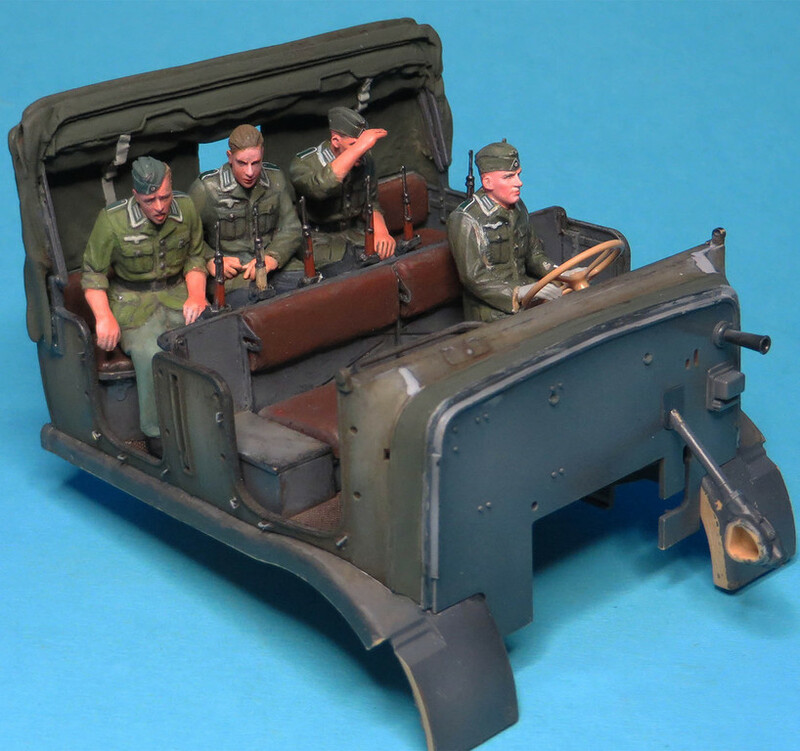 At this point in the war,NCOs and officers were in short supply and I doubt there would be this NCO convention going on in the back seat. Small thing I know but it contrasts with the excellent job you did on all the rest. That is a good pickup on the collar tabs. Markings are from Archer and all I can say is excellent service. Ordered the Archer decals on the 29th of December and received them last week.Excellent service. Click on images for close in detail. I like the headless guy on the left rear fender of the Trailer. Seriously- I know first-hand what an effort it is to build, detail and paint a huge project like this. I've done it, and I don't want to do something like this again too soon! Slowly losing the intention (Mojo) to complete this. Getting a desire to move onto something else and have a break. There is a Fury Sherman on the wishlist to do and it's hard to stay Focused. Hi Michael - beautiful work, as you've shown throughout the build! Yes, the loss of mojo - a bummer indeed! I've set a recent project down for a while - I realized I was just working to get it finished - Bad approach!! Quality was beginning to slip, and I was looking for shortcuts. So, rather than slipping into creeping mediocrity, I began fooling around with a different subject and scale. Seems to be doing the trick, as I'm now thinking positive thoughts about my "forgotten project" again, and will get back to, and finish it! Good luck with whatever you decide - I don't mind waiting a while to see your great build get wrapped up! Massive build mate! Keep up the good work. As Nick said a break might be the best thing so you don't rush for a finish. Either way it will be there waiting to be finished hey. Are you going to start a new thread for your Fury build ? I ran into the same problem whilst working on my last big dio. Hard to stay focused for so long!! I would periodically take a break and finish a small project or maybe two,just to give myself the feeling of completion. It turned out to be a good remedy. Of course,not everyone is the same and I think you will figure out a solution. Don't give up though,as this is a great project! It will be spectacular when it's done. Heck,it already is! Thanks Nick will be getting back into the panzer 3 and I'm checking what colour schemes to use and further battle damage. Thanks Ultra_Aussie ,yes the Fury Build will also be a build blog and not as long . Dennis I admire how many projects you have on.Well done. Thanks Jerry,I'm still partly involved with the panzer 3 on the trailer, so in terms I have not completely lost focus. OK,no harm,no foul! You have a much better work ethic than I do,that's for sure brother. Switching between model projects has given me more incentive to get back and complete the Famo. Have been working on a couple of things over the last few months and have just finished a British modern Main Battle Tank.The Takom Chieftan MK11 fell together and here is the end result. A first for me to complete a model in 2 and a half months. Now I roll on with the Famo. Great looking Chieftain! Breaks are good to lighten long projects. Full steam ahead with the Famo build and on with some model painting. 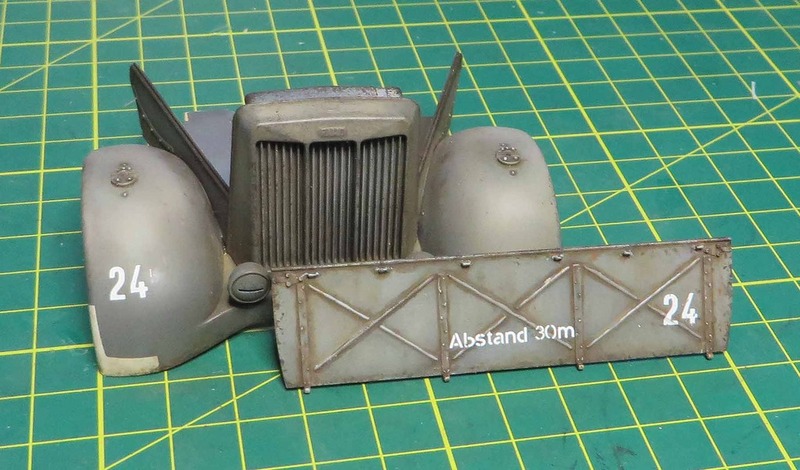 Once more it is slowly getting there, have been tinkering around with trying to get the right colour for the famo front end with washes and chipping. 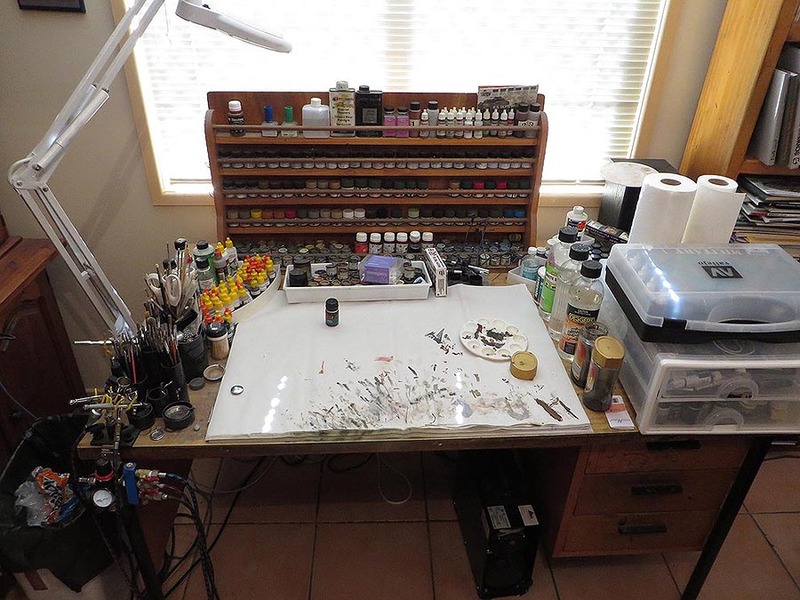 The problem arising for me was I had crap everywhere on the painting desk and needed to rectify the sprall of products. hey mate,great job it will soon be done. 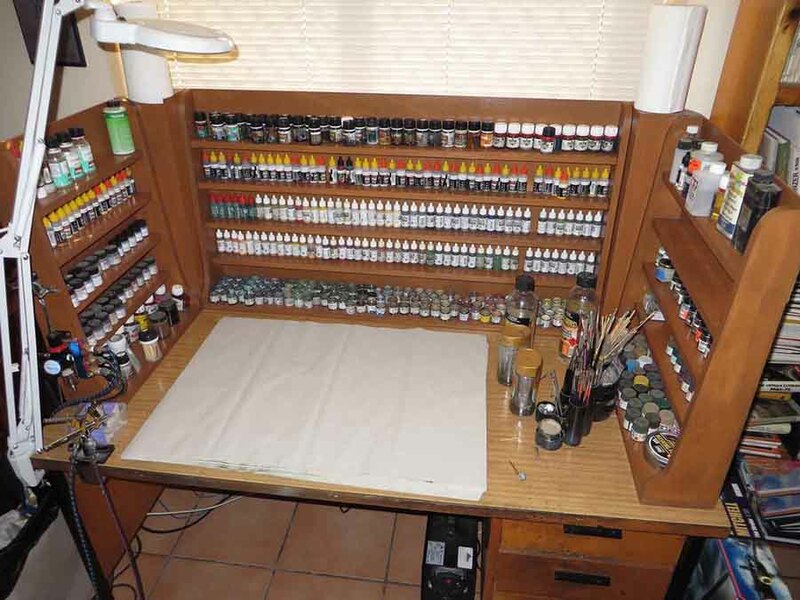 your old man did a great job on the paint racks. Your fiqures look great too.